1. Melt the butter on stove or microwave, then stir in brown sugar, molasses salt and spices. I like to do this in a huge 8 cup measuring cup-- and mix it all up right in there. Cool a bit, and mix in the egg. 2. Stir baking soda and baking powder into the flour, and mix with wet ingredients. 3. Divide the dough into 4 pieces, put each into a quart ziplock bag, roll slightly and refrigerate for at least an hour. 5. Using one piece of chilled dough at a time, roll out dough. If you roll it thinly the cookies will be crisp, if you roll it 1/4 inch thick, they will be chewy. I like to roll it between sheets of baking parchment. This way you do not have to flour the surface of the dough to avoid sticking. 6. 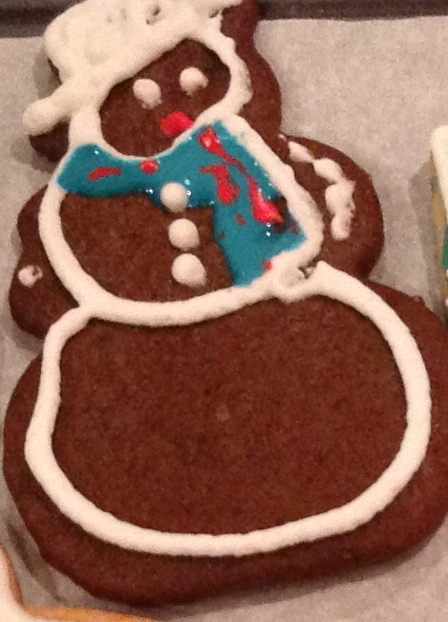 Working quickly as you can, use cookie cutters to cut shapes, and transfer to lined baking sheets. Gather scraps into a ball, and return to ziplock in the fridge to re-chill. 7. Bake until they're slightly brown around the edges 8 to 12 minutes, or until they feel firm. Let the cookies cool on the baking sheets for several minutes, or until they're set. Transfer them to a rack to cool completely. Repeat with the remaining dough. 10. 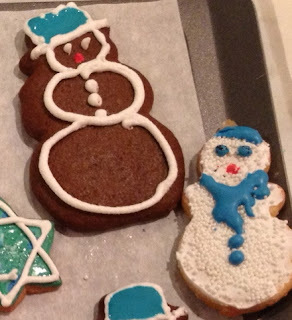 Decorate the cookies with Royal Icing and desired decorations.